Whether we can recite bits of the famous “I Have a Dream Speech” or simply understand the cultural and historical weight it carries, most Americans are familiar with the ideology of Dr. Martin Luther King, Jr. Most Americans understand what it means to have a dream. Most Americans understand the necessity and urgency of freedom and the desire to cultivate their own sense of the American Dream and what it means to each person and how individual dreams are threads in the collective blanket of co-existence. With that being said, we can continue to learn a lot about what it means to be personable, to be understanding and to be empathetic to our fellow man and woman. The speech continues to speak to the essence of humanity. This essence shows us what it means to be a part of a culture and space in time that allows us to participate in a society that makes a way for individuality and acceptance. Dr. King’s speech reminds us that each of our futures are tied together. Therefore, if we oppress one, we oppress all. In a contested world where we find ourselves at odds with our fellow man – whether it be political, social or educational – we must appreciate the differences in each other and meet each other where we are. Furthermore, when Dr. King said, “We cannot walk alone,” he meant that we must carry each other through times of distress but also rejoice together in times of joy. As citizens, it is our civic duty to treat each other as equals in order to guarantee a peaceful society. America was founded on this idea. There is a sense of security in justice for all and this leads to a place of social rest in a society where we find ourselves at a constant unrest. The ideals of the constitution should be regarded as more than skin deep and reach into the fabric of America. King simply wanted all people, regardless of color and gender, to be able to not just exist, but thrive together as promised by the constitution to all citizens. As we progress throughout 2017 and look to all of the changes that await us politically, personally and those we are yet to know, we must remember that we are people first and ideas second. 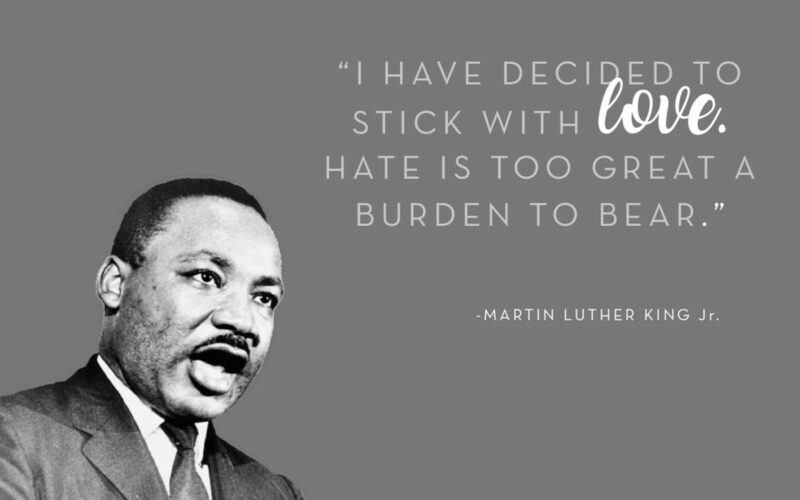 We must remember that in order to show true acceptance, we must conduct ourselves with respect, honor and discipline, just as Dr. King exhibited through his fight for civil rights, not just for one group, but for all people. Although Dr. King gave his famous speech over fifty years ago, the message is still true and valid today. His speech urges us to be respectful of the ideas and values of others while also embracing the thoughts and ways of life of others. Dr. King stands as an eternal model of strength, freedom and the possibility of holding on to a moral and just society.